Always listen to an album first before reading the label info sheet. With Eternal Reign, it was clear from the beginning that this is a German band. Not that I don't like German bands, but when the vocals betray your origins so strongly, maybe it's time to refresh your English pronunciation. 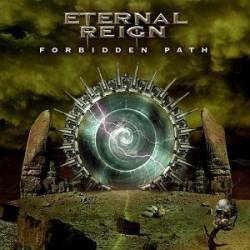 The way it seems, Eternal Reign are some kind of hype among power metal fans, who shamelessly compare these newcomers (although Forbidden Path is already a second album) to early Queensryche and other progressive minded bands. Excuse me, but maybe I have been listening to a different band? Forbidden Path never gets above average. There are three things wrong here. First, and worst, of all the vocals by Dirk Stühmer who sounds like a constipated man with haemorrhoids trying to have a dump. He's forcing high tones that he doesn't manage rightly, squealing in an unnerving way, never building an inch of power. Second problem are the keyboards that, although decently in the background, drain away the little power left. Third and last is the band's near refusal to leave mid-tempo regions. At times they speed up, but never for long, and mostly to no avail. All of this makes every song seem to last for half an eternity. The album ends with a cover version (Ten Seconds In) by Breaker, a supposedly cult band I hardly ever heard of. Seems more to me that they want to build up power metal credibility. As much as I believe that they have original mint vinyls of Heir Apparent, Agent Steel and Savage Grace at home, this doesn't make them their equals. As legions on the Internet seem to love Eternal Reign, don't let yourself be scared off by my review, but sincerely, I don't get the hype around this more than questionable effort.